Although the old buildings are gone, the landscape around Ankerwyke is probably not much different from when de Vere was a boy. That it has remained free of construction over the centuries must be due, at least in part, to the fact that this area along the Thames, so close to Windsor and Windsor Park, has always been owned, long ago by farmers, but even in Smith’s time by gentry and wealthy families. It is chiefly the skies that have changed, for today it lies a stone’s throw from Heathrow. This section of the Thames has shrunk in volume since Smith’s day, and will no longer carry much heavier craft than kayaks and canoes, but then it was, as it had been for centuries, the main thoroughfare for those who lived along it to get to London and back and to visit the homes of friends who also lived along it. The north bank on which it stood is somewhat higher than the Berkshire shore to the south and west, which was then (and still is) a flood plain–-another reason, no doubt, why that stretch has remained free of construction. 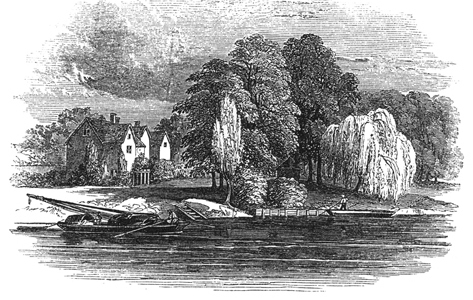 18th century engraving of what was then left of Smith's manor at the bend in the river. The old hall was torn down in the 19th century by a Smith descendant to make way for an up-to-date Victorian built farther back from the river. It too is gone. Today the spot where Smith’s home must have stood is a round grassy field bounded on most of its circumference by tall trees, on the rest by the bend in the river. Behind and on either side of the house would have been the gardens and orchards that Smith planted wherever he lived, also long gone. 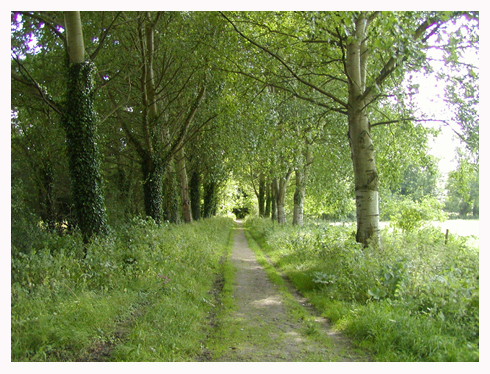 Today the path that visitors must follow to get to the site passes through an “alley” of trees that ends on the river path, the sort that every country squire once planted as an impressive natural entry to his estate (Click to enlarge). Although Smith may have planted such an alley, this could not be the original; few trees live for four hundred years. One that did live that long can be seen nearby where the ruins of an ancient yew tree remain, still alive (though just barely). It’s thought to be some 2,000 years old, but it was certainly alive and no doubt already an object of interest in Smith’s day. Also remaining is either a portion of a wall of the old priory that he dismantled to build his mansion, or perhaps a bit of the mansion itself. For the rest, one must use one’s imagination. 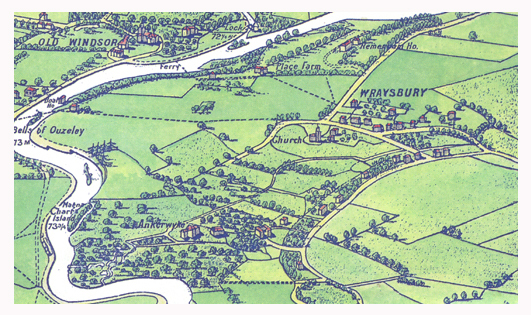 According to George Lipscombe, historian of Buckinghamshire, Ankerwycke priory was founded during the reign of Henry the Second by Gilbert de Montfichet, lord of Wyrardisbury (pronounced Wraysbury, as it’s spelled today). Dedicated to St. Mary Magdalene, it was one of many small nunneries created during the Middle Ages as places where single women of local gentry families might live “useful” lives. By the beginning of the sixteenth century its modest assets could have supported no more than six or seven nuns besides the prioress. 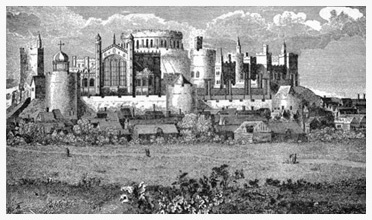 The nunnery was absorbed by the Crown at some point before July, 1536, when the prioress, Magdalen Downes, was discharged with a pension of £5 a year, one of many poor nuns turned adrift from such priories between 1536 and 1538. According to a report created for the diocese of Lincoln that listed all the pensioned monks, nuns, and cantarists still living, Magdalen Downes was still alive in 1552 (355-57), at which time she would have been in her fifties or sixties. * So it’s possible that the old prioress would have been known to Smith, who began rebuilding her former home in 1550, and perhaps also to little Edward, whose home it became in 1554. The nunnery, with the estates belonging to it, were added to those of Bisham Abbey (further up the river, just past Windsor Castle) in 1538, which were then, following the surrender of that monastery in 1540, granted to Lord Windsor, whose son and grandsons would cause so much trouble for both Smith and de Vere later on. Having soon afterwards reverted back to the Henrician Crown via an exchange with Lord Windsor, the property was sold (or traded) to Smith in 1550 by Edward the Sixth, while the Bisham Abbey property was sold or granted to Sir Philip Hoby three years later. In 1549, Sir Philip had aided the majority of the Privy Council in the traumatic coup that cost Sir Thomas his post as Principal Secretary and that had also made it possible for Hoby’s brother-in-law, William Cecil, to take Smith’s place at Court and on the Privy Council; probably not Hoby’s intent; just Smith’s bad luck to let himself get so closely bound to Somerset. Smith's manor house was located within the bend in the river in the lower left corner of this 19th century map. The house depicted here is the Victorian built much later by his descendant. For a boy whose inheritance included a romantic vision of the past, Ankerwycke was rich in historical associations. 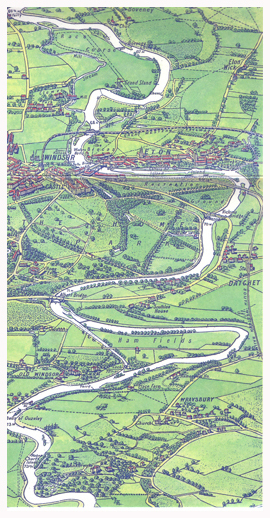 Back when the shore wasn’t lined with trees as it is today, the Isle of Runnymede (see above) was well within view. As Smith must have informed his young charge, it was here that in 1215, his ancestor, the third Earl of Oxford, parlayed with twenty-four other barons beneath the famous Charter Oak before signing the Magna Carta. The closest town to Ankerwycke was Old Windsor (in the upper left hand corner above), across the river, the oldest Saxon town in the region and the ancient seat of Edward the Confessor. His crown would have passed in time to the Saxon nobleman, Edgar Atheling, who would have been the first Earl of Oxford, had not England been invaded just then (1066) by William of Normandy, who gave the earldom instead to de Vere’s Norman ancestor. Along the river between Windsor and Oxford stood the gorgeous Medieval abbey of Abingdon, built in 675 AD by a king of Wessex (West Essex), who, like many other builders of abbeys and monasteries in the Middle Ages, craved a retreat from the world. Though no longer a Church property it would still have been a thing of splendor in Smith’s time, as it had been lavished with expensive new construction by four fifteenth-century abbots. Here, during the Middle Ages, the so-called Abingdon chronicle was painstakingly compiled by hand by educated monks from texts dating back to the ninth century, to form an important part of what we now call the Anglo-Saxon Chronicle, the oldest history, so we’re told, of any European country in a vernacular (non-Latin) language. These records of the kings and events of the period make clear why kings and queens might wish to create sanctuaries to retreat from a world in which brutal wars raged continually amongst native British, Norse Vikings, Danes and Norman French. 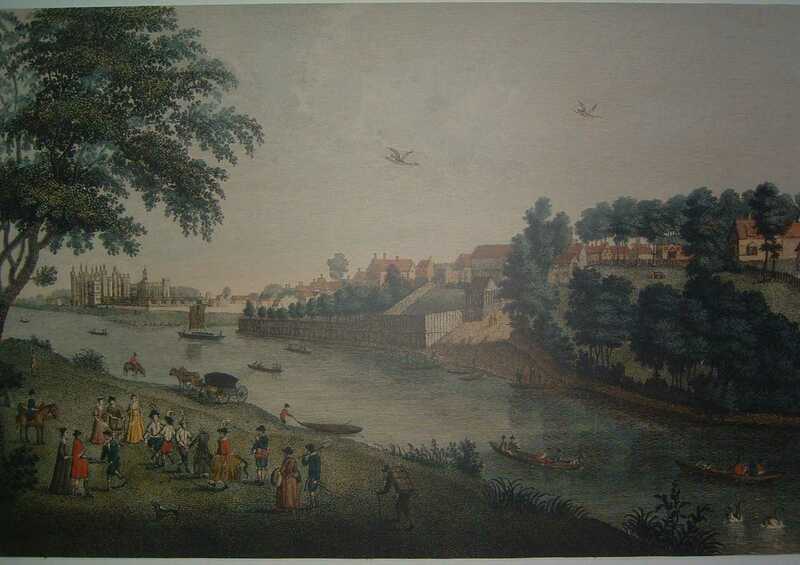 On occasions when the Smiths had reason to travel downriver, as their barge rounded each bend in the Thames one royal palace after another would come into view, each fronting on the river: Hampton Court on the right, Richmond on the left, Lambeth on the right, and, as the city with its multitude of buildings began to appear on the left, Whitehall, and the great manors of the nobles and Court officials whose houses lay along the Strand that paralleled the river, including the splendid Somerset House, built by the Duke during Smith’s time as Secretary. Finally, navigating the dangerous currents that poured through the narrow straits beneath London Bridge, they would pass the sombre Tower on the left. like the house of a celestial cathedral! What multicolored roofs! What windows! What turrets reaching toward the stars! And what pleasure gardens and ever-flowing fountains! furnishing the delights of a bright garden. In Edward’s time, the Thames was the great “King’s highway,” each bend bringing a new vision of magnificence into view, until it climaxed with the great city itself. Having lived with Smith from the beginnings of his memory at age four through age twelve, and having experienced contact with him at Court during his twenties (Smith died when Edward was twenty-nine), Sir Thomas Smith was without a doubt the individual who most affected his development. Since we have a fair amount of information about de Vere through his twenties during the years he was at Cecil House and involved at Court, while of Smith we can gather quite a bit from his letters, his written works, and documents that show how he was seen by his contemporaries and for the generation or two following, we can feel fairly confident with regard to the general nature of their relationship. Not so with Smith’s wife, Philippa, surely the leading lady in Edward’s childhood drama. Second only to Smith himself in terms of influence over de Vere, we wish we knew more about her. In her early thirties when she married Smith, shortly before Edward came to live with them, she was almost forty by the time he left at age twelve. Based on the little we know of her, all we can say for sure at this point is that she was no “patient Grissel,” content to sit silently by. Sadly, it’s unlikely that his own mother, Margery Golding, Countess of Oxford, had much to do with him as a young child, nor should we blame her or think it unusual. Few young English aristocrats, then or later, had more than a passing acquaintance with their parents until they were finished with school. If de Vere’s parents played any role in his early life it would have been as idealized dream figures who came to life briefly once or twice a year at Court ceremonies, decked out in full regalia, surrounded by holiday-goers and well-wishers. On the other hand, Edward would probably have gotten to know Smith’s family fairly well. Sir Thomas’s father and his brothers and sisters all seem to have played an active part in their famous brother’s life, although unfortunately we know little about them. Both his father, John, and his older brother, also John, died in 1557, so Edward wouldn’t have had much time to get to know them. Children were welcome at certain moments during the festivities that marked the winter holidays at Windsor Palace, Queen Mary’s favorite winter resort. Here, in the company of the offspring of the palace retainers and those from nearby villages and estates, Edward would have seen puppet shows and possibly even been allowed to watch from a balcony in the great hall as his parents and other adults danced galliards and pavannes to music composed by Court musicians. During these get-togethers he must have connected with other children of his rank, among them his teenaged Howard cousins, Thomas and Henry, now being raised in London by the ultra-conservative Catholic clergyman John White (who replaced Smith’s old tutor, John Taylor, as Bishop of Lincoln) and their mother, his Aunt Frances, his father’s sister. He may also have had the chance to socialize with his many de Vere cousins, the children of his father’s numerous siblings. As for his parents, it’s more likely that he would have seen them at Windsor or at Whitehall in London than at Hedingham Castle, a long trip for a young boy on icy, frozen rutted roads. The magnates, particularly those subject to royal disfavor, were well aware that it was unwise to keep the holidays at home. To a studious boy raised in solitude by a parsimonious scholar, the glittering lights of thousands of candles, the sweetness of perfumes, candies, and freshly cut herbs, the richly colored clothing of the dancers and musicians, the shouts of excitement at the antics of clowns and acrobats, the chaotic gabble of a dozen conversations all going on at once, must have been thrilling and a little overwhelming. The “Yorick” who bore him “on his back a thousand times” would have been either the witty, gifted John Heywood, the playwright/musician/comedian who provided Queen Mary and her Court with holiday entertainments, as he had her father before her, or the legendary Will Sommers, King Henry’s aging jester. One of these might easily have “poured a flagon of Rhenish” on some drunken bystander’s head, to the shrieking delight of an audience of children. Both men would have been well-acquainted with the sixteenth earl from early days at the Court of Henry the Eighth, where he was involved with them in providing Court entertainment. Far different from the carefully-engineered merry-making at Court was the wild spontaneity of local country festivals, the May-games of spring, the pagan rituals of Midsummer’s Eve, the “mummings and disguisings” of the winter holidays, the running of the stag in Windsor Forest, rituals still in full force in the country villages in Edward’s childhood, though soon to be under all-out attack in the gathering puritan storm. By the end of the Civil War of 1640-80 they would be gone, at least in their fullest form, though watered-down vestiges would remain for centuries in the more distant rural villages. In many places in England today, a come-back is being encouraged, though without the more dangerous (and exciting) features of the old May Games. Every community had its own home-grown version of these festivities, but all involved drinking, socializing, and some degree of sexual license. To what extent Sir Thomas would have allowed his household to get involved in such carryings-on is questionable. Although hardly a radical reformist, it seems clear that he had little appetite for such “country matters.” He would also have felt his responsibility to protect the Oxford heir and prevent his exposure to dangerous or licentious behavior. Smith had a son some three years older than de Vere that he had fathered out of wedlock before his first marriage, but so far there is no sign that young Thomas Smith ever lived with his father and step-mother. None of the rooms in Smith’s Ankerwycke inventory bore his name, nor do Smith’s detailed housekeeping records show anything that can be construed as payments for his upkeep. Which is not to say that Smith ignored him. He may simply have made private arrangements with his mother. Later in life Smith would bring young Thomas with him on one of his embassies to France, and later yet, put him in charge of his plans for creating an Irish colony. At one point, Gabriel Harvey would claim that young Smith had introduced him to de Vere at Cambridge, where he gave Harvey “angels” (money), but Smith’s support of Harvey came after de Vere left his care, so it’s unlikely that the two ever met while still boys. When he wasn’t reading, writing, or studying, Edward was probably happy to follow his tutor around the estate, helping him yank weeds and destroy tent moths, pick herbs and vegetables at their peak, absorbing his tutor’s running commentary on how composting turns nasty waste into useful soil, how grafting can create sweeter and hardier apples and roses, and the thousand-and-one other secrets of Nature that occupy the mind of a diligent gardener. As one who planted in large part to provide herbs for medicines, lectures on their uses would naturally accompany their harvest at the moment that their virtues were at greatest strength. Since these were matters dictated by astrology, lectures on the planets, their names, what principles they ruled, and the astronomy necessary to understand how they manifested their particular powers, would be a natural accompaniment to the collection of medicinal herbs. His mind on his own property squabbles and with no crowd of undergraduates to lecture, basic principles of property law couched in accurate terminology got communicated during honey-collecting or berry-picking forays. Sitting on a fallen log eating apples, bread and cold roast beef from a satchell prepared for them by the cook, Smith’s mind would turn to his favorite poets, chiefly Homer, whose tales had thrilled him when he first began learning Greek under John Redman at the university. Known for his oratorical skills when he taught Homer at Cambridge, Smith would regale the boy, the rabbits, squirrels, and crows who were all the audience he had these days, with Ulysses destruction of the suitors, declaiming in Homeric Greek with occasional pauses to answer questions or make a pedagogical point. When the weather was too nice to stay indoors, they would pack a lunch and head out with the dogs to flush rabbits, the bane of all gardeners, Smith carrying his harquebuss loaded with shot. He would be careful to remain on his own property, not wishing a dispute with his neighbors. Edward on the other hand may well have taken advantage of times when Smith was away or busy to swim or paddle across the river and investigate the Royal Forest of Windsor on the Berkshire side. Today we think of forests as dense with tangled underbrush and littered with fallen trees, but that’s because now they are more or less waste areas. In Edward’s time, the larger forests were highly managed sources of game and fuel. Anyone caught poaching the king’s deer, boar, rabbits, or wood, was in trouble. Grants were made to loyal retainers that allowed them a single deer or two per season, lesser folk were allowed the right to take fallen wood. Timber was felled only at a price. As a result the forests were closer to what we would consider a park. Some areas were wilder than others, but this was the well-considered result of management under a corps of stewards and wardens, whose job it was to police the forest. Yet the forest was huge, the managers were few, and deer, boar, birds and other wild creatures, including the occasional hermit and poacher, managed to live a life of Eden-like immersion in Nature, rudely disturbed from time to time by the trumpets, shouts, and dogs of the royal hunt. For a small boy out on his own it would have been a thrilling place of mystery and constant revelation. As he reveals in his letters, Smith enjoyed almost any reason for being out of doors in good weather. This included the sports of hunting and hawking, and since horsemanship and falconry were things in which a nobleman must also be well trained, he would take Edward with him, sometimes just the two of them, other times in the company of other men and boys, neighbors or visitors, as they followed the hounds into the fields surrounding Ankerwycke and through the Forest of Windsor, merlin on wrist, riding through meadows and leaping over hedges, to arrive home after dark, tired and dirty, to a cold supper by what was left of the kitchen fire. Although the comparison of a woman to an untrained hawk, a favorite of Shakespeare’s, may have been a commonplace in those days, it’s one that Smith might have resorted to on more than one occasion, since, as Dewar points out, it’s obvious from his letters and his dealings with Queen Elizabeth that he had little understanding of women. During a marriage of over twenty years, his relationship with his wife must have gone through a series of changes, but sadly, the final phase would be exceptionally bitter. Smith’s gardens and orchards provided food for the table, but more than this they provided materials for his laboratory, in which his letters demonstrate an obsessive interest, one he probably acquired during his year at the University of Padua, as renowned for its advanced views on medicine as for its teaching of the Law. The word still derives from the verb to distill, the process whereby a substance is concentrated through heating in a glass vessel until the impurities are boiled away. Wherever he lived, Smith created a chemical laboratory with stills in which he decocted medicines, “sweet waters” (mild perfumes), and “strong waters” (brandy and other liquors). His library attests to his fascination with Paracelsian methods of healing by means of medicines created by distilling combinations of herbal teas and minerals. Smith had twenty books on medicine in his 1566 library list. Near Windsor things were quiet, but in London and in Smith’s home county of Essex, now with his old adversary William Bonner at the helm as Bishop of London, the imprisonments, tortures, and burnings raged on. “Bloody Bonner” or “the Bloody Bishop,” John Foxe called him. 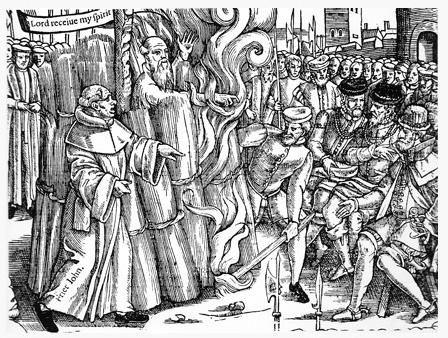 In 1556, Smith must have wept to hear how his old friend John Cheke had been arrested by Philip’s agents while living in Strasbourg, bundled back to England, thrown in the Tower, and intimidated by the Dean of St. Paul’s into recanting his Protestant beliefs in public. Sadder yet, the scorn that this brought down on the gentle scholar from his reform community, plus his own bitter self-reproach, must have contributed to his death the following year at age forty-two. A similar fate took away another colleague from Somerset days, Sir James Hales, former Judge of the Common Pleas. But time was passing; winds of change were beginning to stir.